Freshman Andrew Carlson breaks off the defender as he looks for the pass. It’s a wrap for the Pima Community College Football. The Aztecs will ride out the 2018 season as it is their last opportunity to step on the field. Because of lowered enrollment at Pima Community College, the school has seen a decline in its overall budget. The funds had to come from somewhere, and some of it needed to come out of the athletic department. The plan originally was created by Athletic Director Edgar Soto and ordered by Chancellor Lee Lambert. Four budget plans were proposed: two $1.9 million plans, one with football and one without; a $1.7 million plan without football; and a $1.5 million plan without football. Lambert picked the $1.9 million budget plan without football. This was because if Lambert chose the $1.9 million plan with football, every other men’s sport would have been cut except soccer. Junior colleges in Arizona (Maricopa County Community College District), have started to eliminate their football programs. The five community colleges in Arizona that will discontinue their football programs at the end of the year are Pima, Scottsdale, Glendale, Mesa and Phoenix. Budget cuts to Arizona’s community college system have caused the board to find a department that is expendable. The board decided that football would be the one to go as there were also cuts from the other schools in the division. Before the season started, head football coach Jim Monaco spoke about his outlook for the season and how the team is coping with it ending. 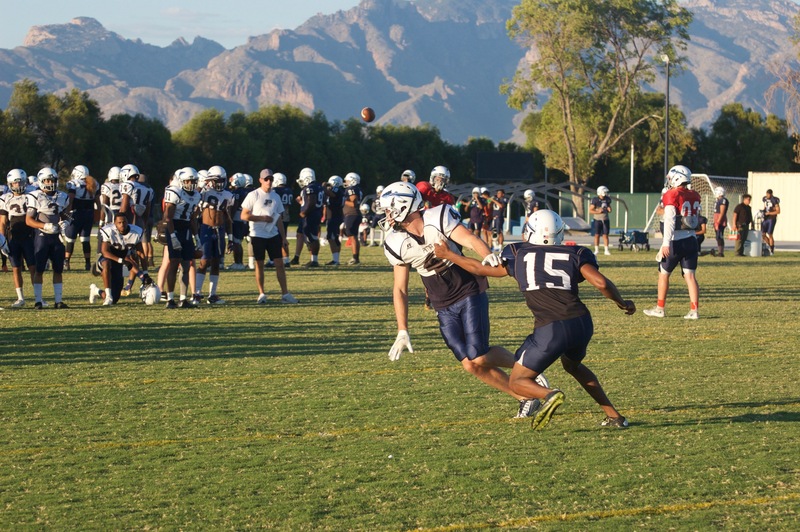 The team was practicing hard on a recent Thursday for its first game Oct. 1, which is away at Eastern Arizona College. Monaco doesn’t think the news that the football program is ending is what’s fueling his team. Last year, the Aztecs struggled, coming up with only two wins. The energy the team members were exuding at the recent practice made it seem they had something to prove. On Sept. 1, the Aztecs traveled to Eastern Arizona to play its first game of the season. The Aztecs were defeated 21-0 by the Eastern Arizona Gila Monsters. The Aztecs struggled on offense, only having a total of 86 yards. Offensive stats included 13 yards rushing on 21 attempts while completing 9-19 passing for 73 yards. The defense held its own against the passing attack, holding the team to just 17 yards on 1 of 5 attempts. But the run game for Eastern could not be slowed, as they ran for 204 yards. The Aztecs look to improve those numbers after the bye week. On Sept. 15, the Aztecs traveled to face off in the second matchup of the season against Glendale Community College. The Aztecs earned the win, 30-13, because of a great defensive performance. The defense came up with six interceptions, and the interceptors were sophomores Tony Fair, Leonard Lee, Christian Maddox and Tommy Lawrence and freshmen Leon Huey and Moris Lugo. The tempo of the game was set early when Marquise Cooper linked up with receiver Larry Rembert for a 91-yard TD pass for the first score of the game. That play set the tone for the rest of the game as the Aztecs started with 23 unanswered points to start. Aztec kicker Jamie Avila was named Special Teams player of the week because of his; 3-3 field goal, and 3-3 extra point attempts. Compared to Week 1, the passing attack and the defensive effort showed improvement. The Aztecs will be back on the road Sept. 22 when the team plays at Phoenix College at 7 p.m.